The application is open until May 15, 2018. In recent years, Lattice QCD (LQCD) calculations of the properties of stable hadrons have become considerably more precise. As a result, LQCD inputs are having an increasingly significant impact on Standard-Model phenomenology. Considering this progress, it is natural to also examine the prospects for using lattice QCD to calculate the properties of unstable hadrons, i.e. QCD resonances that decay via the strong force. 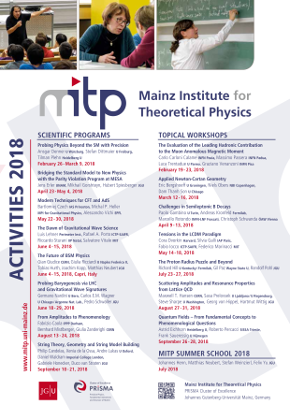 The extraction of resonance properties is much more challenging, but also in this sector enormous progress has been made in the development of both theoretical methods and numerical techniques. The key challenge in such calculations is that a resonance does not correspond to a true quantum state and thus cannot be directly interpolated. The ultimate goal is to use LQCD to study various exotic resonances, including the recently-discovered X, Y and Z states. Indeed, in the meson sector, LQCD has already made significant progress in characterizing the charmonium spectrum, including excited and exotic charmonium states. One also aims to extract resonance form factors and to perform precision tests of the Standard Model. For instance, processes such as B→K*μ+μ- are particularly important for LHCb phenomenology. Another compelling example in this class of observables is the time-like pion form factor. The aim of topical workshop is to bring together experts in developing the formalism with lattice practitioners, in order to review the status of these calculations and discuss future prospects. The workshop will emphasize the future role of LQCD in precision resonance physics, especially in the context of forthcoming experiments.